My previous reference to caramel sauce version 3.0 as an acceptable final product was flat out wrong. After tasting it again, the grainy texture was even more pronounced. So despite The Mistah’s insistence that he’d eat it, there was a (completely premeditated) accident that involved the garbage disposal, caramel 3.0, and a steady stream of hot water. My hope was to replace it with a proper caramel sauce without The Mistah ever knowing. Why does this sound like something that would happen if Lucy ever tried to cook for Ricky? All I needed was a partner in crime, an Ethel. My only witness to the foolishness that was about to follow was Shadow. And that doesn’t have the same comic value. All of the previous attempts had been “wet” caramel, where you cook the sugar in water. The idea is that the sugar melts and the water cooks out. As the water cooks out, the sugar boils and develops into rich, complex caramel. Except that sometimes it doesn’t. Sometimes the sugar molecules latch onto one another in that syrup and as the water cooks out, the sugar turns back into granules. 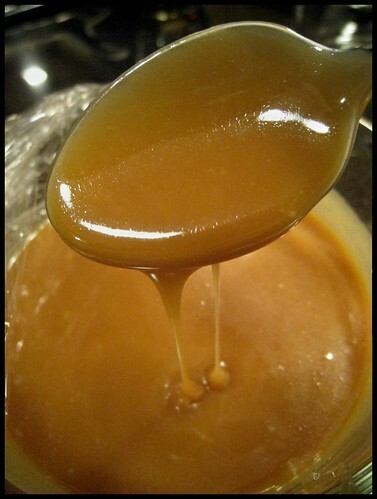 The other approach to making caramel is a “dry” method. As you might have guessed, there’s no water used in the dry method. Some people think it’s easier to simply melt the sugar in a dry pan. I found that there are just as many pitfalls with this approach. Your sugar can still seize up into large, solid hunks if you stir it too much. Your sugar can burn if your heat is too high or you don’t stir it enough. The one batch that I did get to melt completely had a bitter, burnt taste. Of course, I didn’t know that until after I wasted the cream to turn it into sauce. At this point, I feel like I’m damned if I do and I’m damned if I don’t. So after three more failed attempts, I walked away from Ina, Alice, Elise, and David. And out of curiosity, I picked up Bon Appetit – Fast, Easy, Fresh. Thank god they had a recipe that was neither a “wet” caramel nor a “dry” caramel. Actually, I’d have to call it more of an “alt” caramel. Because in the true sense of the word, it’s not really caramel. Yes, it is sugar and cream and butter. But it’s also corn syrup. And it’s all cooked together. And it totally worked. It might not have the same depth as a true caramel sauce but whatever y’all. It’s still better than picking up a jar of something at the store that has more chemicals in it than my parents’ swimming pool. Yes, it has corn syrup. For some people, that’s going to be a deal breaker. Me? I can live with the compromise. But if anyone is interested in coming to my house and schooling me on proper caramel sauce technique, I’ve still got half of that 5 pound bag of sugar looking for a purpose. Combine all ingredients in heavy saucepan and cook over medium heat until brown sugar dissolves. Increase heat to high and cook, stirring occasionally, until the sauce thickens and darkens slightly. BA-FFE says 4 minutes. I cooked mine for more like 10 minutes. Let sauce cool and enjoy. Congratulations! And I think everyone will be so amazed that you made any homemade caramel the won’t care about that tiny amount of corn syrup or that it’s not from white sugar. So what are you doing with all of this caramel? I’ve got my ice cream scooped. Top me! So happy you found caramel happiness! Y’all will be terribly disappointed to hear that the sauce is all gone. Some of it went to top the Thanksgiving cheesecake. Not sure about the rest. It *might* have been sacrificed in a post Turkey Day refrigerator clean out. I’m toying with the idea of giving it another go with the wet technique. Only this time, buying myself a little bit of insurance and adding some corn syrup to the mix. I have several caramel “incidents” in my past…you are brave! Or, fake it till you make it. Wendi: I’m leaving you an open invitation to teach me how to make awesome food. Jessica, you get yourself to Maryland and I’ll gladly share some of my kitchen secrets with you. Saw him the other week on Fox and Friends. he makes clones of stuff that is famous and/or extinct. I even found a recipe for Spatini. the spouse will be overjoyed! He misses his Spatini like his momma used to make LOL! I know you mentioned Starbucks in one of your posts. There is whole section on Starbucks. Starbucks Carrot cake Cranberry bliss, lemon loaf……I am going to have fun. Even Arby’s Horsey sauce…..LOVIN THIS!!!!! Got the book on Amazon next best thing to e bay! Emily, sadly there is no room on the bookshelf for another cookbook. But that sounds like quite a lot of fun. Maybe the inspiration for you to start blogging, perhaps? Spatini, my grandmother was heartbroken when they stopped selling it. She has one last packet that she’s holding onto. Maybe you and I can work out a trade…some Sweet Cascades treats in exchange for the recipe? I tried to make homemade caramel once but it burned :(. Congrats on succeeding to make caramel! Lookit! Alton brown puts corn syrup in his caramel too! If Alton can do it, so can you! Have faith! When the mixture reaches 230 degrees, reduce the heat to medium and allow the sugar to color gradually. As the temperature approaches 300 degrees the color will start to turn to amber. At this point, it’s safe to swirl the pan gently to help distribute the heat evenly. As the caramel heads towards 340 degrees, it will reach a deep amber color. Remove the pan from the heat and slowly stir with a metal spoon, allowing it to cool until the caramel falls from the spoon in a solid stream, like a string. When it does, it’s doodad time. Form doodads by holding the spoon 12 to 16 inches over the caramel and drizzling the patterns on the parchment. (Hint: allow the spoon to unload into the pan for a few seconds before attempting doodad. This will allow a narrower stream.) Quick back and forth motions or side to side movements are best. It’s all in the wrist. Allow doodads to cool for 15 minutes then peel the paper off (not the other way around). Stack in an airtight container with wax paper between each piece. To make the bananas brulee, quarter the bananas (peel on) and rub into sugar to coat thoroughly. Remove peel and place on cooling rack over several layers of foil. (Don’t try this on your dining room table.) Don your safety goggles and fire up your torch. Hold the torch so that the very tip of the flame barely touches the banana, and move quickly back and forth until the sugar melts, turns brown, and bubbles. As soon as it looks like caramel, move on. You know you’ve got it down when a solid, glasslike sheet of gold (no graininess) has formed on the banana. Thanks Emily, I’ll have to give Alton’s recipe a try and see if I can’t get a true caramel win. So today I log on to discover that Deb at Smitten Kitchen has posted a butterscotch recipe that looks suspiciously like the caramel recipe I always use. A quick google search tells me that caramel is made with white sugar, butterscotch with brown. Guess I’ll keep making butterscotch then! Beth, I think we should start calling our hybids Carascotch. Or Buttermel. Will have to hop over to Smitten Kitchen and check things out. Ok one more time…….one Spatini recipe coming up then I go to bed! Here ya go! Hope Gramma likes it. I tried it tonight…….tastes very similar to me…..but then I add V8 juice and cut back on the tomato sauce stuff. Pulverize the bouillon cube. Mix with remaining ingredients in a small bowl. To make spaghetti sauce follow the same instructions that appear on the original box. 3. Makes about 1 pint of sauce 4-1/2 cup servings. Emily, that’s awesome. I will make a batch up this weekend for my Grandmother. She’ll be thrilled. Karine’s entry made me wish I ate red meat. That’s funny because Karine’s post made me wish lamb and I didn’t have such a hateful relationship. But I think we’ve got too much bad history to make up now. Baking party? Hells yes. Do you think we could get any of the other local folks interested? I’d gladly offer up the BAH kitchen. But I think I should recuse myself from preparation of the cooked sugar component of that frosting. Hey, it worked! Yay for invert sugars. And I would disagree that the addition of 2 tablespoons of corn syrup made it “not” a true caramel. 🙂 I think it’s frequently used in the making caramel. My alt caramel feelings stem more from using brown sugar instead of white and cooking everything together instead of letting the sugar simply cook down and develop all those lovely, complex caramel notes. It’s a great workable solution though. I’m just trying to convey that purists may call it a knock off.